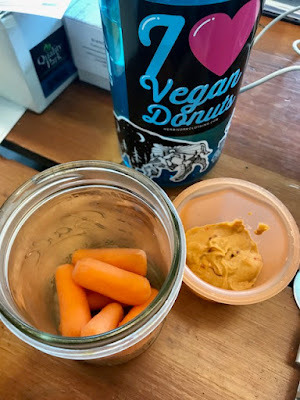 Back in November, I blogged about a "perfect day" of eating, following No Meat Athlete podcaster/cookbook author Matt Frazier's guidelines for how he aspires to eat in a day. The "perfect day" prescription is in his 7 Daily Foods Cheat Sheet, which you can download for free here. 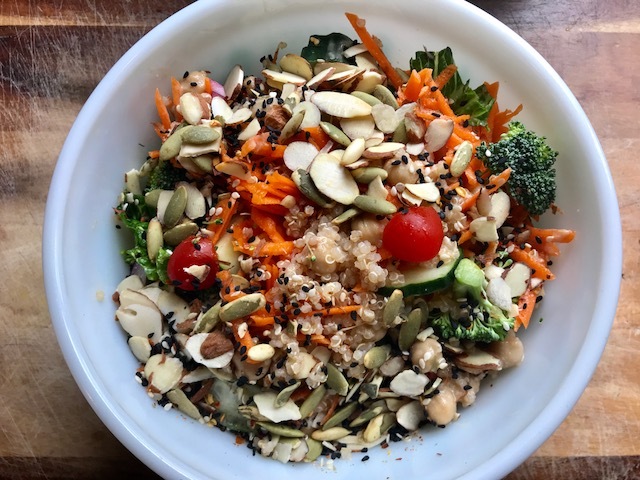 But it really comes down to a simple formula — smoothie for breakfast, salad for lunch, green/grain/bean bowl for dinner, and whole foods-based snacks. And that's what I did today! I've been eating a lot of desserts lately since our new plant-based cafe is open at Crosstown Arts, where I work (and we have vegan danishes!). So I needed a day free of sugar and full of wholesome things. By the way, expect a full post about that cafe very soon! Anyway, my morning started with half a Nature's Path Superfood Dark Chocolate Peanut snack bar (made with peanuts, chocolate, chia, and other whole foods) before a lovely bike ride around Midtown. 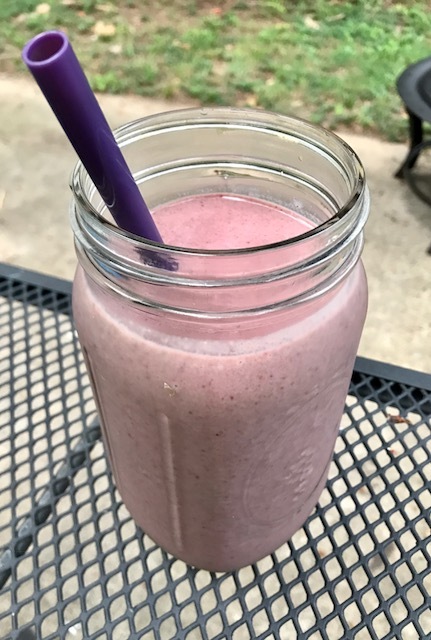 After my workout, I had this giant smoothie made with the recipe for Matt's Kid-Friendly Everyday Double Berry Banana Smoothie from the No Meat Athlete Cookbook. This has one-and-a-half bananas (for one serving; recipe makes two), a frozen berry mix, almond milk, spinach, ground flax, and raw walnut butter (recipe called for walnuts, but I was out so I used walnut butter). I rarely make smoothies without protein powder, so this was different. And still pretty filling! I loved how creamy it was with all that banana. Morning snack at work was Baby Carrots & Roasted Red Pepper Hummus — which I've been eating every day at work this week. And I went home for lunch to this lovely and giant Salad with Chickpeas, Quinoa, & Oil-Free Garlic Tahini Dressing! Filled up a whole mixing bowl. It also had carrot, cherry tomato, cucumber, green olives, red onion, broccoli, raisins, and Trader Joe's Seedy Salad Topper (a mix of almonds, pepitas, and some mystery seeds that are kinda spicy!). 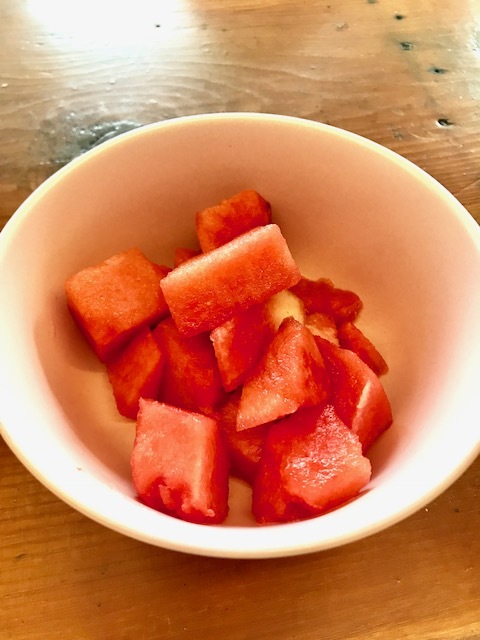 Afternoon snack was Watermelon!! The personal-sized melons have been on sale at Kroger for $1.50 for the past week or so, and I've gone through two now. Served with pink salt, of course. Dinner wasn't exactly a bean/green/grain bowl because it didn't have grains. Instead I used a base of steamed potatoes for this Pinto Broccoli Nacho Bowl. Steamed white potatoes on the bottom, topped with sauteed broccoli, slow-cooked pintos (made in my slow cooker all day! 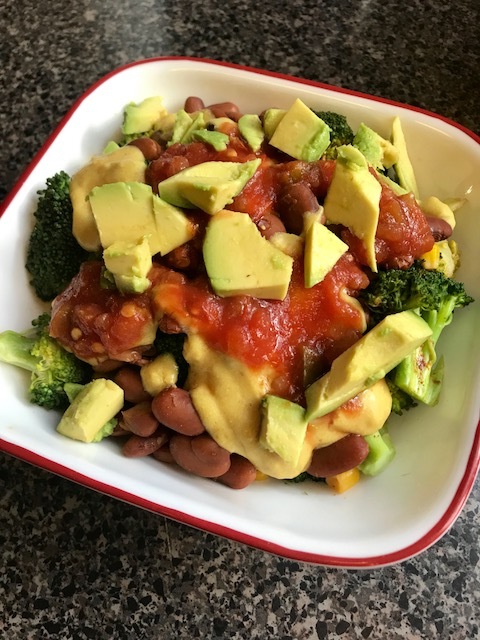 ), a noochy cheese sauce (from Cookin' Crunk), salsa, and avocado. After all that great eating, I had to reward myself with a beer! We had a Crosstown Memphis CDC meeting tonight at Midtown Crossing Grill, so I ordered a Crosstown Brewing Co. Margarita Gose beer to toast to my health. :-) Given how often Matt and Doug talk about beer on the NMA podcast, I think they'd approve of working beer into a perfect day! That salad looks amazing! I've been really craving salads lately! And you know a potato bowl calls to me! That salad is gorgeous!! And hooray for watermelon! I've been eating it nonstop this summer :) Definitely a really great day of eating! I have never tried salt on my watermelon. But it is coming into summer now, so I will have to experiment. I have made that smoothie and it is so tasty!